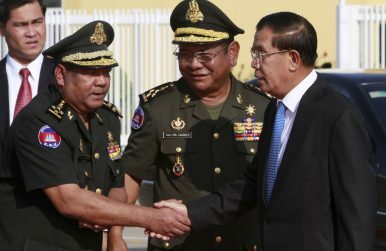 Cambodian Prime Minister Hun Sen, right, shakes hands with General Hing Bunheang, left, the commander of Hun Sen's body guards, as head of Cambodia's Armed Forces Pol Saroeun, center, looks on at Phnom Penh International Airport in Phnom Penh, Cambodia, Monday, Sept. 2, 2013. On January 9, Chinese warships arrived in Cambodia for a scheduled visit. While details still remain unclear, the defense engagement, the first publicized one of its kind between the two sides in 2019, has once again put the spotlight on the military ties between them amid growing hype about Beijing’s inroads in Cambodia. As I have noted previously in these pages, the idea of a deepening Chinese military presence in Cambodia is far from new. China has long been a key defense partner for Hun Sen’s Cambodia, including its top provider of military equipment, and both sides have been stepping up their defense ties in recent years in areas such as new exercises and new Chinese investments supporting military infrastructure. But attention to this trend has grown in recent years due to several factors, including wider concerns about a deepening Chinese economic and security presence in Southeast Asia as well as the setbacks to democracy in certain countries in the Indo-Pacific region. A case in point was late last year, where we saw the latest round of public scrutiny on the notion of a Chinese naval base in Cambodia tied to a controversial, ongoing port project. U.S. officials directly raised the issue with Cambodia and Cambodian Prime Minister Hun Sen received a letter from U.S. Vice President Mike Pence on the topic (See: “What’s in the China-Cambodia Military Base Hype?”). This week, the defense aspect of the China-Cambodia relationship was in the headlines again with the arrival of Chinese vessels to Cambodia. Three Chinese vessels docked at Sihanoukville port for a four-day visit aimed at strengthening ties between the navies of the two countries. The ships, which are carrying around 700 crew members, are expected to stay in port as both sides undertake a series of interactions that would involve Defense Minister Tea Banh and others, Defense Ministry spokesperson Chhum Socheat said via his Facebook page. It is far from surprising that Cambodian officials are walking a careful rhetorical balance with the visit, on the one hand demonstrating that Phnom Penh still has partners it can work with despite strained ties with some Western countries, while on the other hand also allaying fears about Chinese military inroads into Cambodia that have been heightened in recent months. Yet that should not be confused with the substantive and substantial inroads China has made on the defense side in Cambodia in recent years, and Beijing’s continued efforts to opportunistically push to envelope on this score where it can. It is that wider trend, rather than discrete interactions such as the warships visit or occasional statements about them, that warrants careful watching for the rest of 2019 and beyond. What’s in the China-Cambodia Military Base Hype?What Will the Next China-Cambodia Military Exercise Look Like?China and Cambodia Hold Their Biggest Military Exercise YetWhat Does Hun Sen’s New Cambodia Military Aid Boast Really Mean?Why Did Cambodia Just Cut US Military Drills?